The blaze broke out at 34th Street and Eastern Avenue Northeast, and was reported by an off-duty firefighter driving past the home. 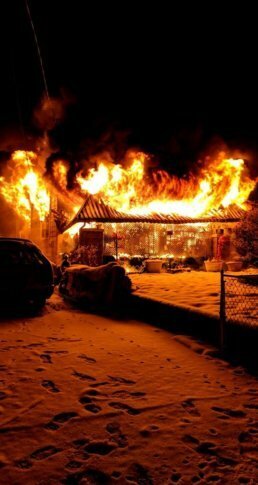 WASHINGTON — Two people are dead following a house fire in Mt. Rainier, Maryland, Thursday morning. The blaze broke out at 34th Street and Eastern Avenue, NE, and was reported by an off-duty firefighter driving past the home. Flames were burning through both the first and second floor of the house. Prince George’s Fire Department arrived on the scene around 6 a.m. They had to pull out after about 30 minutes due to the roof collapsing in on itself but re-entered around 7 a.m. and located the second victim. A neighbor in the area told WTOP in an email that an older married couple had been longtime residents of the house. T.J. Mahoney said they were nice, and had a love for cats and collecting. The couple had several small collections of toys in their front yard, Mahoney said, most notably robotic toy dogs. According to Assistant Fire Chief Alan C. Doubleday, “excessive storage conditions” hampered firefighters in their attempts to battle the blaze. Eastern Avenue, NE is closed between Rhode Island Avenue and Bladensburg Road in both directions. Mt. Rainier is right on the border between the District and Maryland. D.C. Fire and EMS tweeted that its firefighters were helping fill in at Prince George’s Fire Department Station 1. “Always ready and able to assist our neighbors,” they said. Below is a map of the area where the fire happened.